The Japanese Heavy Metal (Visual Kei) band X JAPAN have been announced as the 'Best International Band' at the Golden Gods Award 2012 this week. 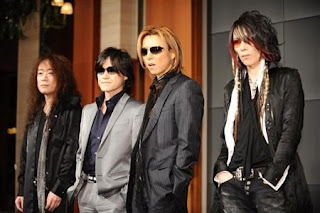 The awards took place in Los Angeles, California this week, and if like me you needed to re-read the name of the award it is NOT the Golden Globes (which Yoshiki from X JAPAN composed the theme music to this year) but is actually the Golden Gods which was created by the music magazine Revolver back in 2009. “Thank you. Thank you for acknowledging us.” He continued, “Right now, we are finishing up our first worldwide debut album. We are planning on doing another world tour. And also to our beloved fans, thank you so much for your support. We are going to keep on rocking. We love you!"